Carolyn Sugiyama Classen, a life long Democrat, was born & raised in the State of Hawaii, was a Legislative Aide for U.S. Senator Daniel K. Inouye on Capitol Hill, and practiced law for a while. In Tucson she worked as a tribal staff attorney for the Pascua Yaqui Tribe and later was the Interim Executive Director of the now defunct Domestic Violence Commission. In 2008 she became a “My Tucson” guest columnist for the Tucson Citizen newspaper, then continued blogging for Tucsoncitizen.com for over four and a half years. Her blogsite was entitled “Carolyn’s Community” about community events and some political news, until Gannett Publishing shut down the site on January 31, 2014. She started with Blog for Arizona on Feb. 11, 2014. Part time she has been sitting as a Hearing Officer in Pima County Consolidated Justice Courts Small Claims Division since April, 2005. She is married to University of Arizona Distinguished Professor Albrecht Classen, a native of Germany. They have one son, who lives in Seattle, WA with his wife and daughter. 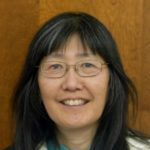 She is also the Editor of the Southern Arizona Japanese Cultural Coalition website, www.southernazjapan.org (since Jan. 2013). Overwhelming crowd tonight (over 100 people) at the Mayor’s house for Kirsten’s campaign kickoff. The Mayor introduced Paul Durham, candidate in Ward 3 and Steve Kozachik, Councilman in Ward 6, both candidates in Nov. Also present were LD 10 State Senator David Bradley, LD 2 House Rep. Daniel Hernande3 Jr., former Congressman Ron Barber, CD 2 candidates Mary Matiella and Bruce Wheeler, David Schapira (from Tempe) for AZ Supe of Public Instruction, Domingo DeGrazia & Nikki Lee, candidates for LD 10 House. Kirsten spoke of the “tremendous energy & enthusiasm” at this party, but that she was angry and fearful of the issues facing Arizona, but had “optimism for 2018”. She’s angry about low elem. school teacher pay, rising college tuition, no funds for the community colleges, the recently passed voucher bill to give $ to private schools. She mentioned her anger at the sexism at the AZ Legislature, an “Old Boys Club”. Why is she running again? Because she “can’t sit back”, and has “work to be done”, wants to be “the voice for LD 10”. Questions from audience were about the Governor’s budget and the Freedom Center at the UA; school recess bills; ERA Amendment chance to pass; AZ Clean Power Plan Bill she introduced to reduce green house gases. Her website: EngelforArizona.com to donate, as she is running traditionally.